FAQ - NextTier Education, Inc.
Find the official answer here. But, just between us, NextTier is what every student preparing for a career and/or college education after high school, or parent or educator helping them, needs. One place to research career paths, link careers to college majors, find colleges based on fit, and then instantly organize all the information, requirements, financial aid, and scholarships necessary to apply and get to college. NextTier helps educators, students, and parents reach their postsecondary readiness goals by providing tools that unlock information about colleges and careers, manage the process, facilitate collaboration, expedite communication, and save time — leading to improved student outcomes. Learn more here. Where does the information in NextTier come from? NextTier aggregates college statistical and application data for over 2,300 schools in the United States by using proprietary methods. All application data comes directly from each college and is cross-referenced with the National Center for Educational Statistics. Scholarship data within NextTier is gained through strategic partnerships. Data used on the careers page is sourced from a variety or sources, including the Department of Labor’s Occupational Information Network (O*NET), and the Office of Employment Statistics. How can I make a suggestion, provide feedback, or request technical support? Suggestions & Feedback: We love hearing from our users; feedback is essential to enhancing our software and our ability to deliver tools that improve student outcomes. Please send an email to hello@nexttier.com with your name, email, and your suggestion/feedback. Support: We do our best to make our software user friendly and seamless. However, we know that from time-to-time users will have questions while using our system, or even find a bug. If you’re experiencing any difficulty please email support@nexttier.com. We’ll be happy to help! Does NextTier have mobile apps? We do! Download the iOS App here, or download the Android App here. Is NextTier offered in Spanish? Other languages? NextTier is available in over 100 languages! Once signed in, to select a language, click on the white NextTier logo in the upper left to expand the nav bar. At the bottom, click on the “G” to bring up the menu of languages. Note: NextTier is translated through a third party and may not be accurate. Names, addresses, and websites may inadvertently be altered. Searching, posting, and messaging within NextTier cannot be translated and must be done in English for proper results. Use translation as a help tool to read content within NextTier only. Does NextTier comply with FERPA and COPPA? How do I change my notification settings in NextTier so I can alter the number of emails/notifications I receive from activity within the NextTier software? Please remember that any button or bubble that is filled-in blue means that notification type is on. Also, remember, once you set your selections, to click “Update” at the bottom. Notification settings are located within your Profile. To navigate to your Profile click on the user icon in the bottom left-hand corner (compass arrow for counselors, single silhouette for students, group of silhouettes for parents). Once on your Profile scroll down to “Notification Settings” and click the downward arrow. A pill-shaped button that says “All On,” when clicked, will turn on all notifications within a category (three categories: Tasks, Communications, Achievements). Upon clicking the “All On” button it will change to say “All Off” and fill-in blue. Clicking “All Off” will turn off all notifications within a category. Refine your selections by notification type (a specific event within NextTier) and medium (email or app push for students and parents, email only for educators). Again, a bubble filled in blue means that notification type is on. If the button is grey the notification type is off. Can NextTier help with career exploration? Can I create custom tasks for my students on NextTier? Yes. Custom Tasks is a key feature of the Educator Platform. For more information click here to review the Educator section of our website. 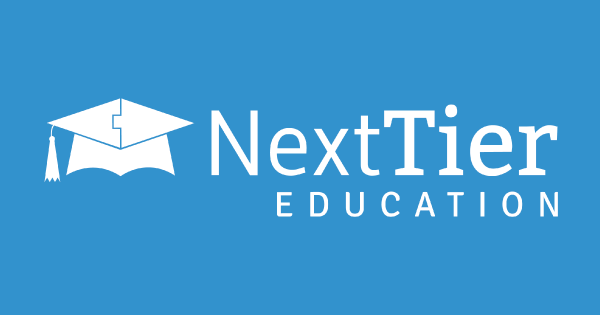 Can I use NextTier to communicate with students and their parents? Yes. As you know, communication is essential to helping students reach their desired outcomes. NextTier makes communication with students easy. Our messaging system brings educators and students together in a familiar way, think Facebook Messenger or Whatsapp. Educators can communicate with parents through Task Notes. How can I get NextTier at my school/district? We’d love to help you reach your goals as an educator. Let’s talk! Please contact us to discuss bringing NextTier to your school/district. Can I submit transcripts through NextTier? Yes. NextTier partners with Parchment to handle transcript submissions. Can I upload information on local scholarships or postsecondary programs not currently in NextTier’s database? Yes, any NextTier partner school can add local scholarships to the database. Do colleges receive my application through NextTier? You will need to apply to each college through their admissions site, the Common App, or other methods they may designate. NextTier will get you to the right place; just follow the links within the Task Detail Pages. NextTier serves most students as an easy-to-use task management tool, a place to find all the information needed, and way to work with counselors and parents along the path to a college education and career. Who sees my activity and messages on NextTier? Your “Team Members” will see a feed of your activity in NextTier. All “Team Members” can see Task Notes. Messages are private, two-way communications. How does NextTier’s Matching Engine determine which schools to suggest to me? The Matching Engine looks at careers you’re interested in, the colleges you’ve already added, your test scores, GPA and other data you provide in your profile. Your test scores will be within the range of scores that each Matching College generally accepts. Matching Colleges also reflect the chosen colleges of NextTier Students that are similar to you. Think Amazon’s customers that bought x also bought y. Can I check-off tasks on behalf of my student? Only students can check-off tasks. It’s important that students own this process. How can I communicate with my student’s counselor through NextTier? By leaving a “Task Note” your student’s counselor can read and respond with a separate note on the same task. Can I connect with multiple students on NextTier? If so, how do I switch between student views? Yes, you can. Click the Tasks icon (clipboard) to bring up a menu of students you are connected with. Click on the student tile that corresponds to the student task list you’d like to view. Can I recommend a college to my student? Yes. Navigate to the Colleges Page. Find a school you’d like to recommend by searching or filtering. Click on the college’s name to see the detail page for that college. Look for the button under the college’s name that says “Recommend” and click it! A menu of your students will appear, click on the student you’d like to recommend the college to. Your student will need to accept the recommendation.